On the other hand many agreed with him. 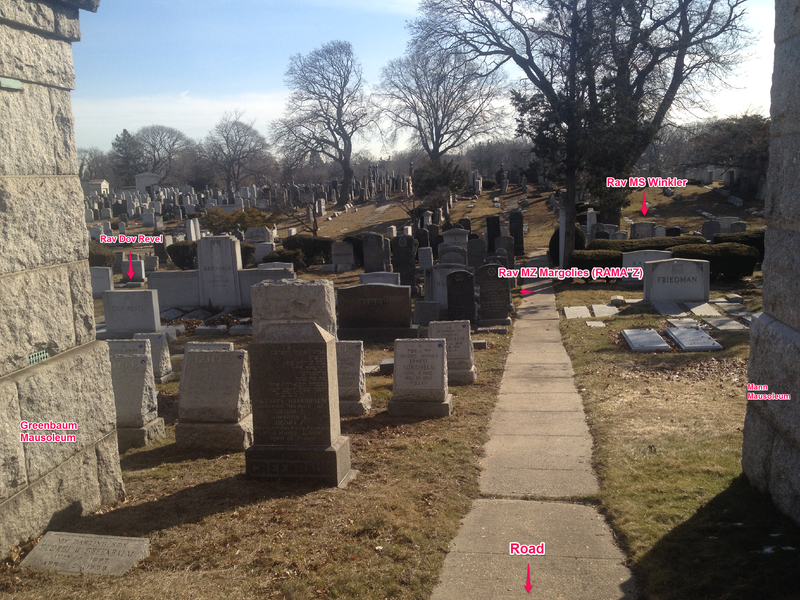 He brought Rav Shimon Shkop to RIETS. A group of boys in the yeshiva were so outrage with the decision, that in protest they left RIETS to learn in a nearby shule. 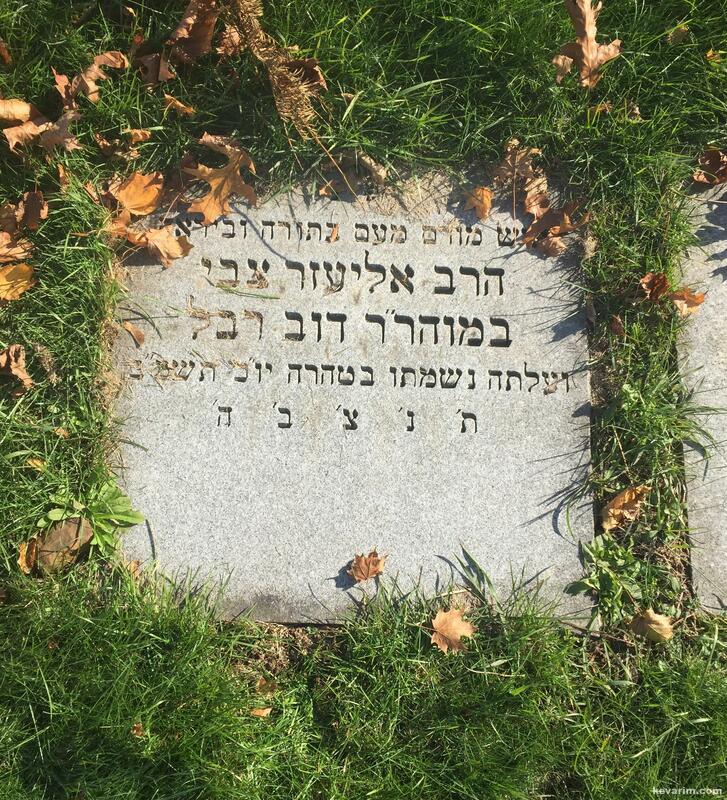 It was in that shule that Rav Nosson Wachtfogel met Rabbi Yehuda Davis and along with Rav Avigdor Miller went to Slabodka. So in away he gets credit for them going back to Europe to learn!!!!!!!! 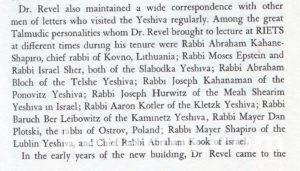 Rav Dov (Bernard) Revel learned in Volozhin and also had a doctorate. @goldvasser: What you wrote is a real perversion of the facts. It’s almost false enough to make it into an Artscroll book. 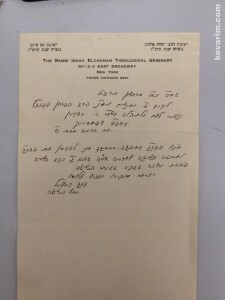 There was no RIETS before Rav Revel. It was a cheder for children which he grew into a high school, which obvioulsy had secular studies. 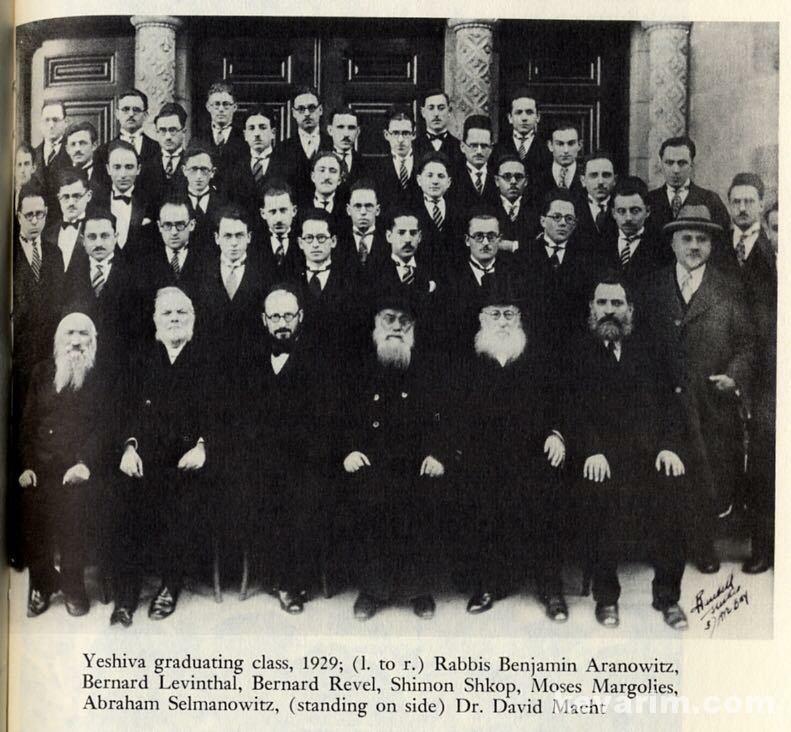 He eventually opened a college so that the yeshiva students would be able to continue their torah studies while pursuing a degree which they would have done anyway in a non Jewish atmosphere. Obviouly there were some decisions he made that were protested against by lots of rabbonim but they were mostly older European rabbis who did not understand what he was creating and why there was a real need for it. 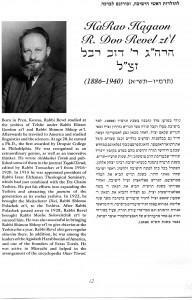 If people wan’t to compain against Rabbi Samuel Belkin for taking it from a Yeshiva College to a real University, maybe that’s another story. 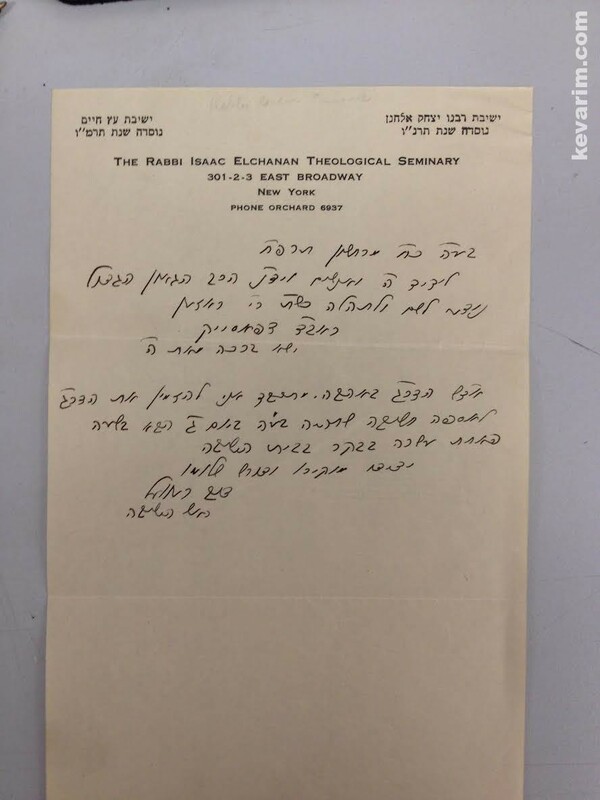 Rav Revel learned in Telshe for a short time. He was known as the Prener ilui. 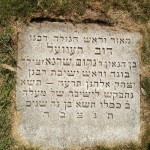 He also learned by R Yitzchak Blazer and in the Kovno Kollel. Your right – he was only born in 5646, so he couldn’t have learned there (at least not before it closed down). Maybe when it reopened ? No. He learned in Telz. 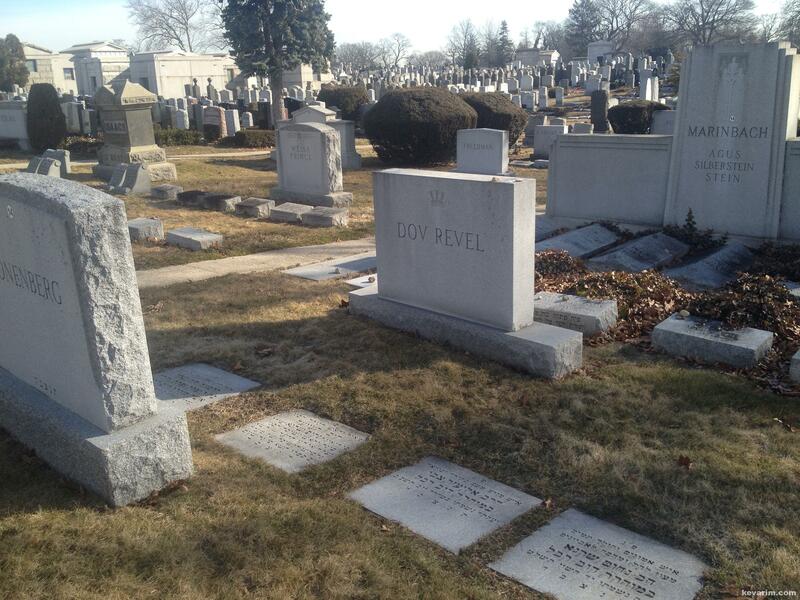 The body of Dr. Bernard Revel, president of Yeshiva College, who died early this morning at the age of 55 in Mt. Sinai Hospital after a week’s illness, lay in state today in the Yeshiva synagogue, where students will hold prayers all night until the services at 11 a.m. tomorrow. 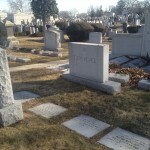 The services will be held in the Yeshiva auditorium with eulogies delivered by Rabbi Joseph Konvitz, of the Union of Orthodox Rabbis, of which Dr. Revel was honorary president; Rabbi Aaron D. Burack for the Yeshiva faculty, Rabbi Joseph H. Lookstein for the alumni, Dr. Pinchos Churgin, president of the Yeshiva Teachers’ Institute, and Samuel Levy, president of the Yeshiva board of directors. Burial will be at Mt. 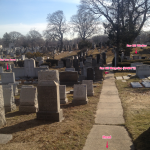 Carmel Cemetery, Cypress Hills, L.I., where eulogies will be delivered at the grave by Rabbi Leo Jung of The Jewish Center, Rabbi Herbert S. Goldstein of the Union of Orthodox Hebrew Congregations, Rabbi Samuel Marcus of the Teachers’ Institute faculty and a student representative. Numerous messages of tribute and condolence were received by the Yeshiva today from Jewish leaders and organizations. Dr. Revel’s completion of 25 years as president of the orthodox rabbinical seminary was to have been celebrated at the annual Yeshiva dinner on Dec. 15. Dr. Revel had lived in the United States for 33 years and was educated at the University of Pennsylvania, New York University and Dropsie College. Previously he has studied at the Kovno Yeshiva in his native city, which is now Kaunas, Lithuania. 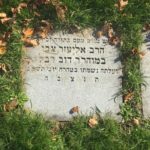 He was the son of Rabbi Nahum Shraga Revel. 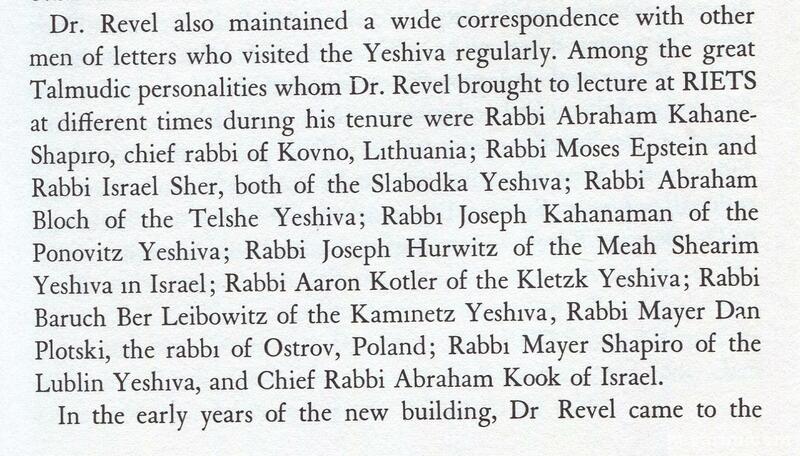 In 1916 Dr. Revel founded the Yeshiva in New York. 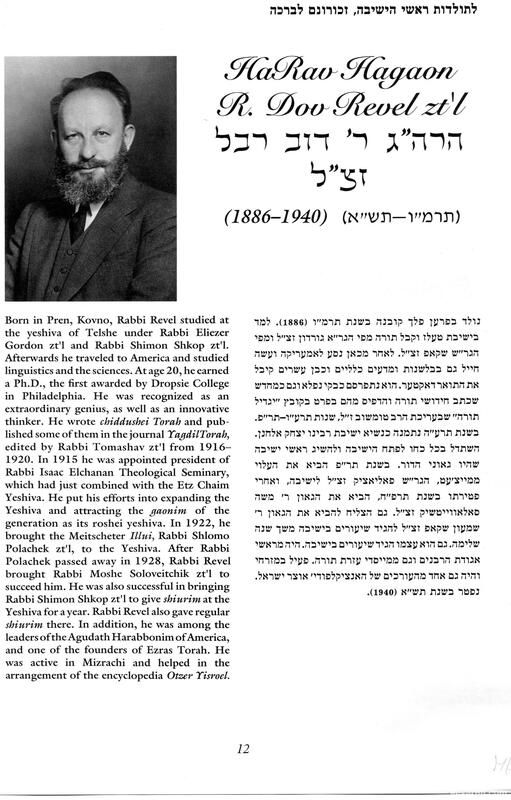 He was vice-president of the Jewish Acadany of Arts and Sciences, associate editor of “Ozar Israel,” the Hebrew encyclopedia, and author of many articles on religious subjects. 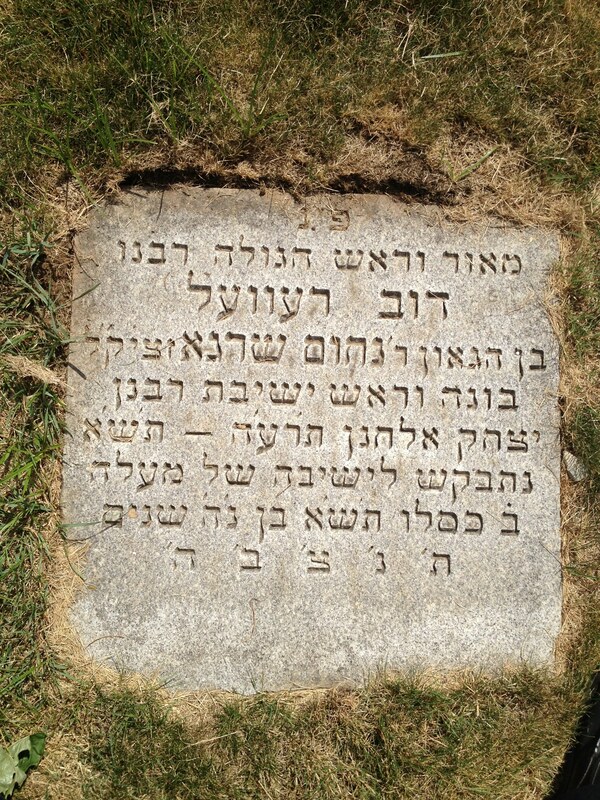 His widow, the former Sarah Rabinowitz of Marietta, Ohic, and two sons survive him.